Another boy’s birthday party that is CUTE: Jumbo Dumbo! For her youngest son’s third birthday, Andrea, of Where the Green Grass Grows, decided to go with this theme idea because “he loves all things Dumbo”. Andrea designed the invitations and paper good supplies with a classic Dumbo silhouette. The party decorations are cheerful and fresh, which work especially well with this pool party. The birthday cake is a simple design (you could do it; I think I could even make this one!) but it’s unique and it looks terrific. Colors, treats and favor boxes on the dessert table would surely entice little party guests. 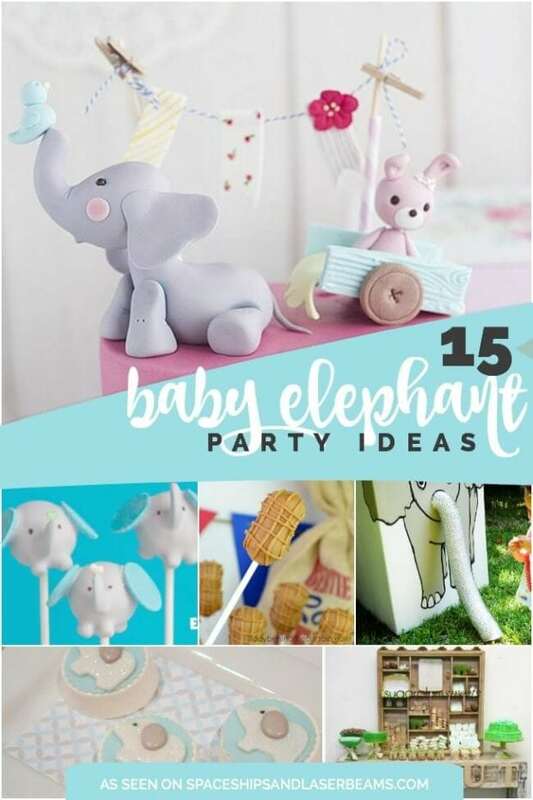 For any kid who is fascinated with elephants –or Dumbo –this is a great party idea. The bright colors and classic characters make this Mickey Mouse birthday party special. This Vintage Donald Duck birthday party is absolutely stunning! Your little ones are sure to enjoy 723 free Disney coloring pages — just download & print! I love Andrea’s idea of layering a variety of ribbons as auxiliary décor over dual coverings on the main serving table. The bright orange, red, yellow and blue are wonderful colors for a celebration. because that is real ribbon on the cake, too! Andrea just peeled it off when it was time to cut the cake. The peanut shaped cookies that embellish the cake are a cunning reference to elephants of course. Note how perfectly those candles work with the color theme, too. The fanciful shape of the blue picture frame (Orange Blossom Shop) adds whimsy to the table and the artwork (one by trafalgarssquare and the other by Andrea) is precious. Miniature blue suitcases (from The Land of Nod) are a deft way to display the books that were gifted to party guests. Andrea created custom bookplates for the inside covers that serve as fun reminders of the party. I always appreciate extra touches like that which might encourage a greater love of reading in boys. Fostering greater literacy in boys is a personal passion; boys generally don’t show a huge interest in learning that important life skill. After the kids enjoyed a main meal, those cute little suitcases also served “fresh roasted” bags of grab-and-go peanut cookies; popcorn cups stand at the ready, too. Individual parfait cups are a convenient way for guests to serve themselves during the afternoon; the touch of blue cream, red ribbon trim and personalized wood spoons look great. You know how hungry kids get when they swim so these easy-to-hold treats are a wonderful idea for helping the party flow. In addition to the books, party guests were sent home with treat-filled favor boxes, too. Looks like the birthday boy and his guests had a jumbo day of celebrating! Be sure to check out the custom printables for this party in Andrea’s Where the Green Grass Grows Shop. Check out more great party ideas perfect for boys.